First book in the Rachel Blackstone Paranormal Mystery Series. From award-winning writer G G Collins. All Rachel Blackstone wants is to talk with her father; solve the mystery of how he died. 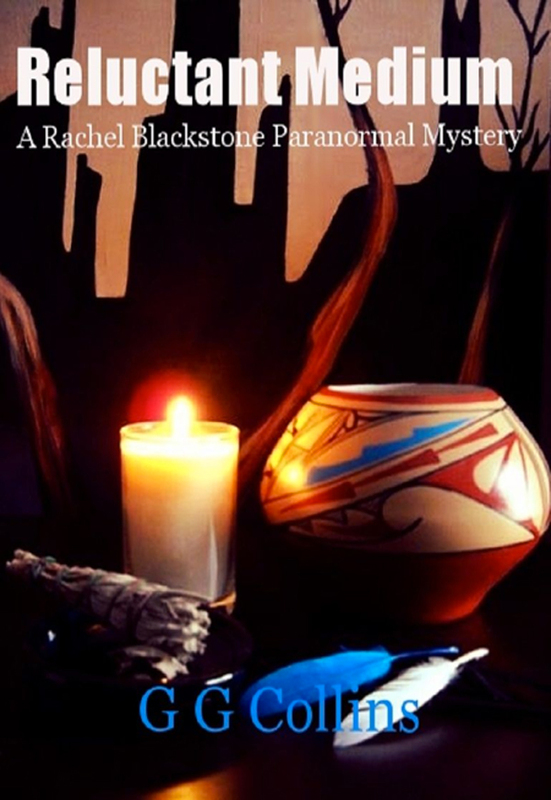 Using a Native American ceremony given to her by a shaman, she summons him in this paranormal fantasy/mystery. Instead, a soul intent on revenge slips through and threatens people she loves. Now the Santa Fe, New Mexico reporter must follow the evil spirit, uncover its purpose and send it back. The shape-shifter has horrific powers. Rachel is tormented by what she has unleashed. There’s more. She’s seeing dead people; which frankly give her the creeps. Some are helpful; others lead her away from the truth. One spirit, a lone wolf, seems to have an uncertain allegiance. What she, and friend Chloe, uncover is an earthly scam involving both the quick and the dead. Rachel must play a dangerous game of supernatural treasure hunt to stop the ruthless ghost. To survive, she must discover her own powers during a climatic storm of earth, wind and fire. To fail is to die. Contains: mild horror effects, profanity, humor. Click on the “Reluctant Medium” book cover above for a Look Inside. Or sample now by clicking on the “Try it Free” box in the right margin. Find “Reluctant Medium,” “Lemurian Medium” and G G Collins on Shelfari, Goodreads, Book Goodies, Book Blogs and Library Thing. AUTHOR BIO: Walking several beats, reporter G G Collins racked up a lot of column inches, a few awards and a writing fellowship at Duke University. She never met a story she didn’t like. The day she discovered the Hopi ceremony to call back the dead, she just had to ask the question: What would happen if the wrong spirit returned? “Reluctant Medium” resulted and a new series was born. FORTHCOMING: “Atomic Medium.” A time warp has opened in a popular Santa Fe retail store. The building was the main office of the Manhattan Project during its development in the 1940s. Evil has once again slipped into Santa Fe. It is using the portal to give the Germans the upper hand during WWII. Only one person has witnessed the entry of two dangerous men through the doorway to the past. If they can’t be stopped, history will be changed. For Rachel and Chloe, it’s no small task: just save the world. You can purchase the book online from Smashwords in multiple eBook formats at http://www.amazon.com/Reluctant-Medium-Blackstone-Paranormal-Mysteries-ebook/dp/B008BVG8UQ.